Gordon Ramsay is known for his devastating insults on his television shows like Hotel Hell, Kitchen Nightmares, and Hell’s Kitchen. As an audience, we love to see people getting completely roasted by the short tempered chef. He can be seen grilling them over any number of errors and disgusting habits. 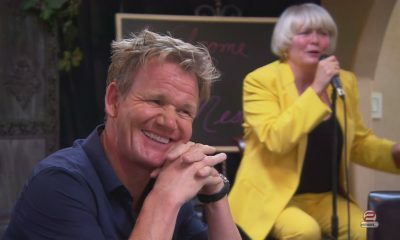 These people might try to cook up some half baked excuses for being so terrible in the kitchen, but Ramsay brings out the knives every time. Hey, if you can’t take Ramsay’s heat, stay out of the kitchen. However, the people on Ramsay’s shows know what they are getting into. They’ve signed up to take his abuse and possibly get burned. What about the people who just try to get Ramsay’s attention on Twitter though? They usually just want Ramsay to take a look at their food and give them some encouragement, maybe even a little bit of constructive criticism. 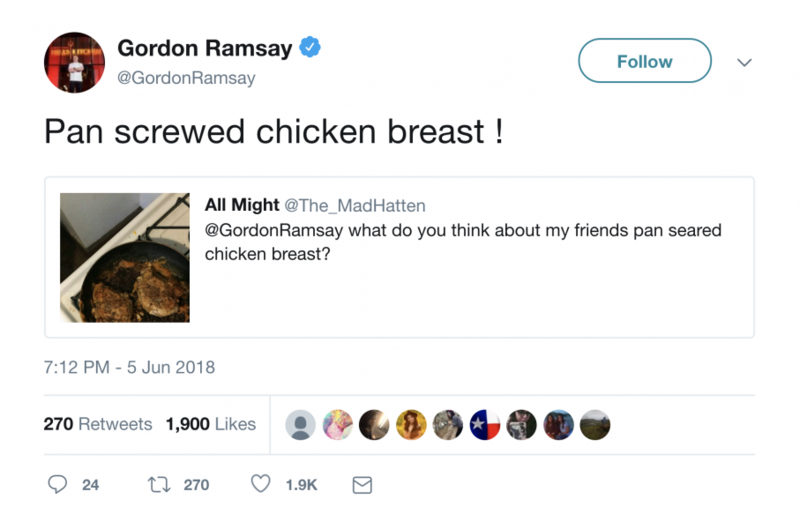 However, after seeing some of the absolutely disastrous food that people ask Gordon Ramsay to comment on, it’s easy to see why he can be so mean about it. Like we said, if you can’t deal with classic Gordon Ramsay insults, then definitely don’t show him your amateur cooking. Even when people are obviously joking about their food pictures, it’s clear that Ramsay is totally fed up with it. 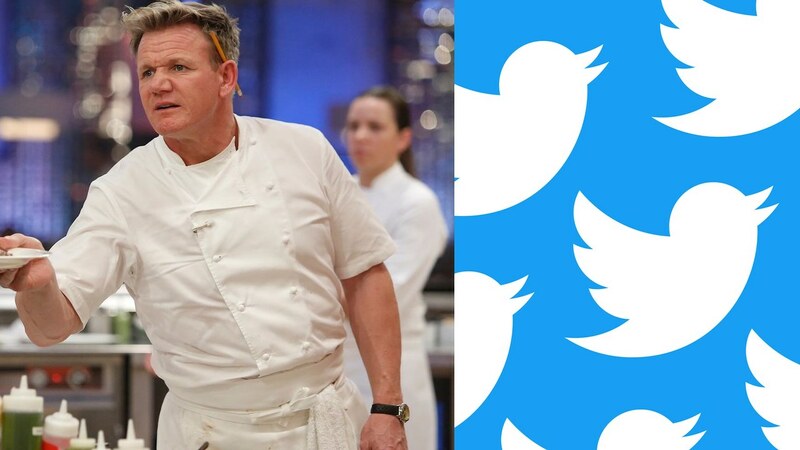 These are ten more of the best Gordon Ramsay insults dished out on Twitter. Bon appetit! Pan searing a chicken breast to perfection is one of the simplest and finest things you can do in the kitchen. It requires very little skill beyond knowing how long to cook your chicken breast so it is 1. Not burned and 2. Not dry. It really shouldn’t be that hard, but clearly this person’s friend deserved any ire that Gordon Ramsay felt like he needed to throw their way. As far as Gordon Ramsay insults go, this is one of the simpler ones, and yet the beauty of the insult is in its simplicity. Ramsay doesn’t have to say much more than what this person did to a nice piece of meat, which is to say they screwed it up. Did this person’s friend ever find out that they showed a picture of their culinary disaster to the master of the food based insult? If they did, they might not want to be this tweeter’s friend anymore. 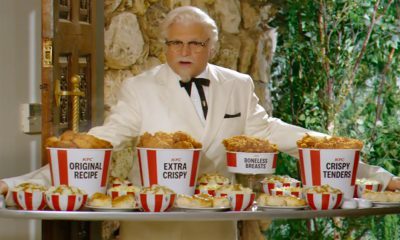 That might be for the best though, because then they don’t have to eat any more terrible chicken breast like this one. The lesson is clear: you should only be friends with people who know how to cook. Find some people who can make you a nice meal and be nice to them. That’s a great life lesson. Like a seared chicken breast, scrambled eggs are something that everyone should know how to cook. They’re quick, easy, and with the right care, they are completely delicious. However, they are not always photogenic, no matter how good they taste. This person’s “authentic chorizo and eggs” might be the most delicious thing anyone has ever eaten, but there’s no question that it looks pretty bad on camera. 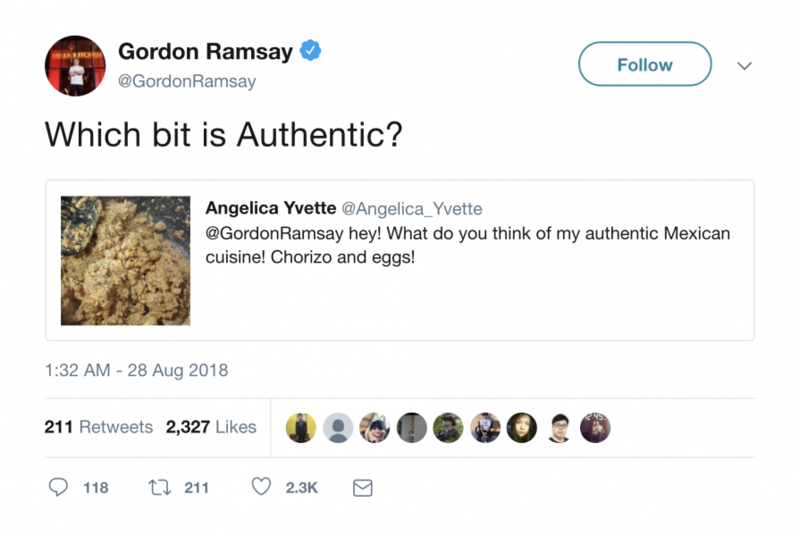 You can’t really blame Gordon Ramsay for not really getting into this, or asking where the authenticity is. One of the big rules of cooking and fine cuisine is that presentation is everything. If you’re not immediately appetized upon looking at a dish, then you’re not really going to get into it. This person might have done better to wait until the dish was finished cooking and plated. At least then they could organize it into something that looks somewhat palatable. Making scrambled eggs look good isn’t entirely impossible, but if you’re trying to do it while they’re still in the pan you’re going to have a hard time impressing anyone, let alone Gordon Ramsay. This dish could also use a little more colour, maybe some chives or fresh herbs to brighten up that look even just a little, because right now, it’s not looking so hot (even if it tastes hot). Sometimes people are just asking for it, you know? Like this guy for example. 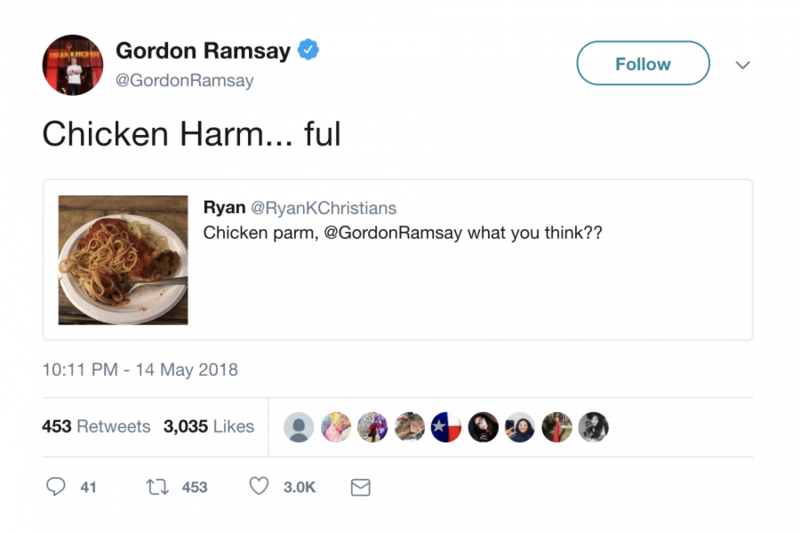 He clearly knows that Gordon Ramsay insults most of the food he sees, and he must know that his dish here is going to get skewered pretty badly. He doesn’t take any precautions in making his food look appetizing or even presentable. 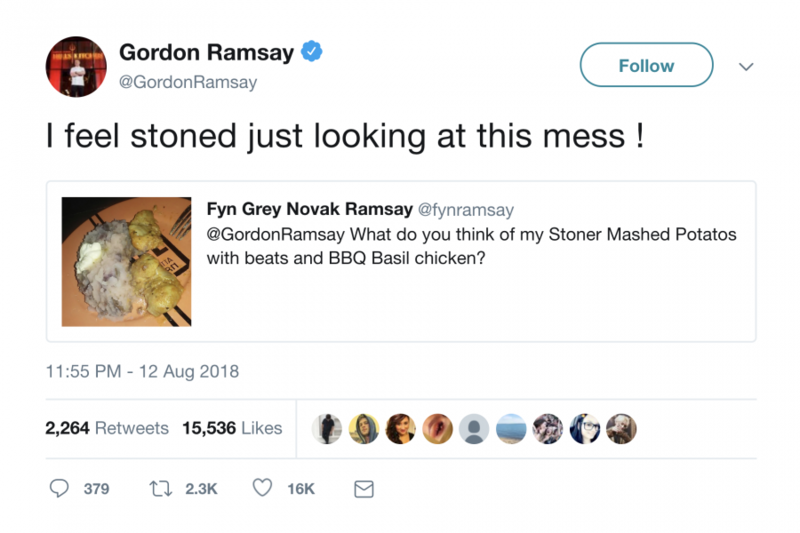 First, he leads by calling it a “stoner meal.” That’s a bad start already. 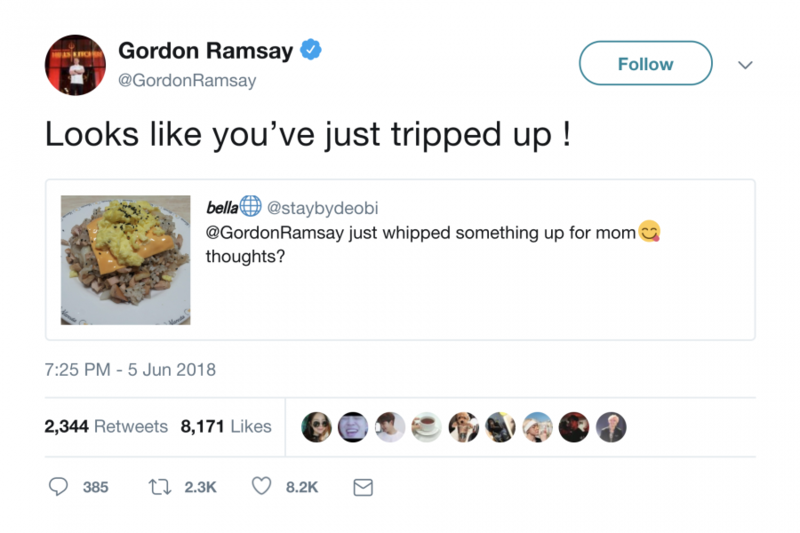 You don’t want Gordon Ramsay to have any ammunition when he insults your food, so telling him that you made it when you were stoned is not putting your best foot forward. Next, the photo is dreadful. The lighting is awful, the food looks hastily put together, and everything is just an absolute mess. This leads Gordon Ramsay to tell this person that he feels stoned just looking at this plate. Can anyone really blame him? This dish is just so incredibly terrible it could make anyone question their mental state. 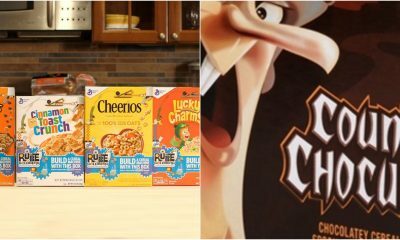 In the future, it might be better for this person to keep their stoner meals to themselves. They can just throw on Dark Side of the Moon, chill out, and eat their weird, gross food out of sight of everyone else. Maybe it will help them reconsider their life choices. Like we said before, some food is just not photogenic. Usually that includes poutine, or at least anything that resembles the French Canadian combination of fries, gravy, and cheese curds. Even the word “curds” isn’t very appetizing. And yet, this person truly thought that they would impress Gordon Ramsay with this messy looking plate of probably frozen fries covered in cheese and gravy (in this instance they also threw in some green onions for colour, so they get the slightest bit of credit for that). However, this isn’t even real poutine because it foregoes curds for just plain old shredded cheese. Also, if that isn’t a white cheddar, then this person used mozzarella, which is pretty sad considering how mild of a cheese it is. If you’re going to make some kind of culinary mess like this, at the very least use a sharp cheddar or something. Gordon is right to utilize the appearance of the food for this particular insult. 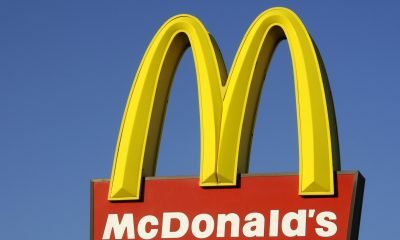 There’s no question that this kind of thing could cause someone to have… let’s just call it digestive distress. Hopefully this person learns that you can’t just throw together things people like, such as fries, gravy, and cheese, and it’s going to be amazing. You have to do it with a little bit of nuance, talent, and know-how. 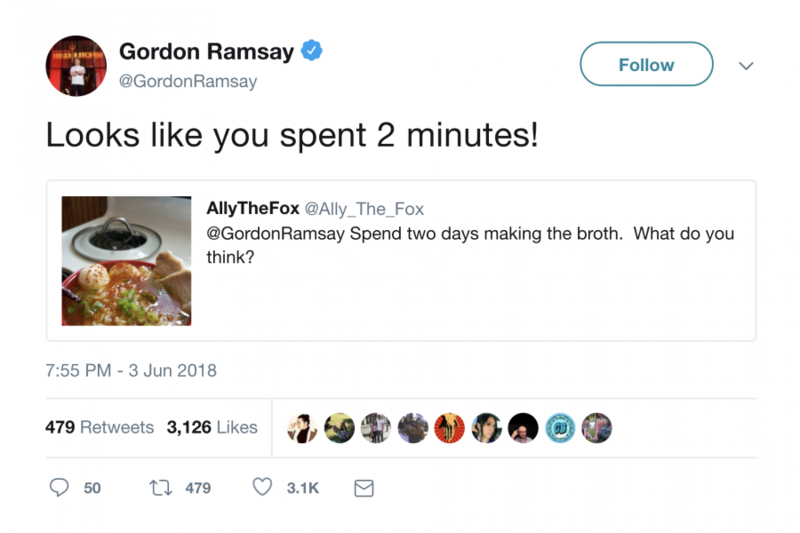 No one is safe from the barrage of Gordon Ramsay insults that find their way onto Twitter, not even something as big as YouTube. 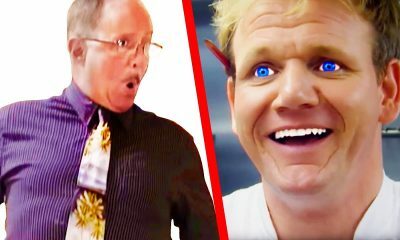 In this instance, they took it upon themselves to show Gordon what they had come up with, and despite the fact that YouTube is a huge corporation, Ramsay holds nothing back in his appraisal of their culinary skill. What’s really disappointing here is that YouTube can’t even get it together enough to make a fresh guacamole. Is it so crazy to think that YouTube would have access to some fresh avocados? Or should we all be glad that even though they could afford to make new guacamole, they prefer not to be wasteful by eating the not so fresh stuff? It’s hard to say. What we will say is that an everything bagel with jalapeño and cheddar sounds absolutely amazing and we would all like to know where to get one. 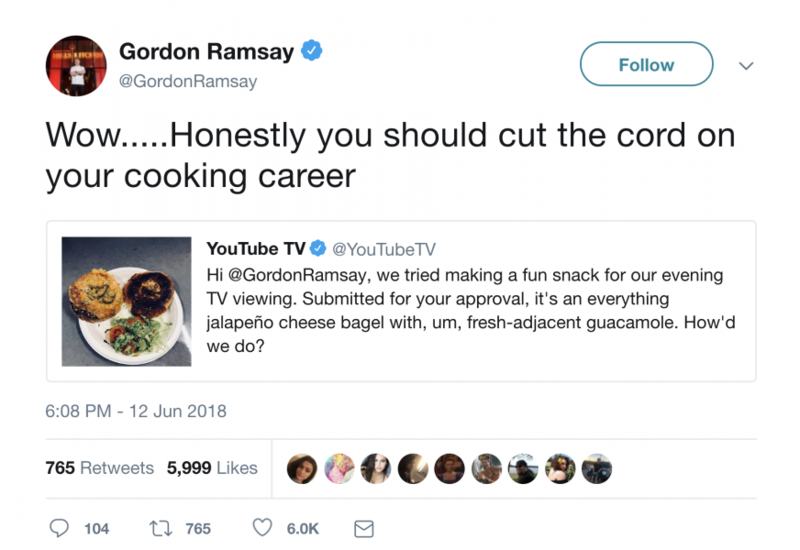 Getting back to Ramsay’s insult though, he cleverly utilizes a phrase associated with streaming services in general to ultimately throw an insult at YouTube (which, by the way, is a platform that Ramsay has utilized to share his own cooking videos). Hopefully they stay friends. When you’re making a meal for your mom, you have to put a lot of care into it. We all know this, so why is it that someone decided to give their mom this particular meal? What are we even looking at in this photo? Our best guess is that it’s hash browns topped with a Kraft single which is then topped with scrambled eggs. This person has to be joking, right? They can’t possibly think that anyone, let alone their own mother could really enjoy this? When your mother makes a meal for you, she pours her heart and soul into it. She works so hard to make sure that you’;re eating something hearty, healthy, and delicious. She picks each ingredient with care and knowledge. This is just something that looks slopped together from leftovers in the fridge. Gordon Ramsay is right to insult this one, if only because it’s meant for a mother who probably deserves a whole lot better. The lesson here is that if you’re going to make something for your mom, maybe stick to a macaroni picture, or a poorly made clay bowl. If this is the kind of food you’re going to be churning out, then you deserve the wrath of Gordon Ramsay. Once again we come to the problem of cooking eggs. It’s such an easy thing to do, but it is also an easy thing to screw up. Hence the scorn that Ramsay seems to reserve for people who don’t seem to know how to do it. Now, a nice brown, crispy ridge on a fried egg in’t inherently bad. In fact, it can a little bit of texture and flavour to your eggs that you wouldn’t be getting otherwise. However, the key is to cook the eggs so that you get the brown, crispy edge without completely overcooking and decimating the rest of the egg, particularly the yolk. The holy grail of fried egg is crispy edge, runny yolk. This person clearly did not get the memo on that, and it really does look like they cracked these eggs in a frying pan, put them on a stove, and just left them there for way, way too long. This is the other golden rule of cooking eggs: don’t take your eyes off of them. They go fast, and that can easily lead to the overcooked mess that Gordon Ramsay had to look at. As a chef, Ramsay has seen his share of overcooked eggs, and by now, he must be pretty tired of looking at them. There is nothing more simply insulting than suggesting that something someone cooked looks like, well, it came out of a dog. Either that or it was meant for a dog, but is one really better than the other? In this case there really is no right answer. 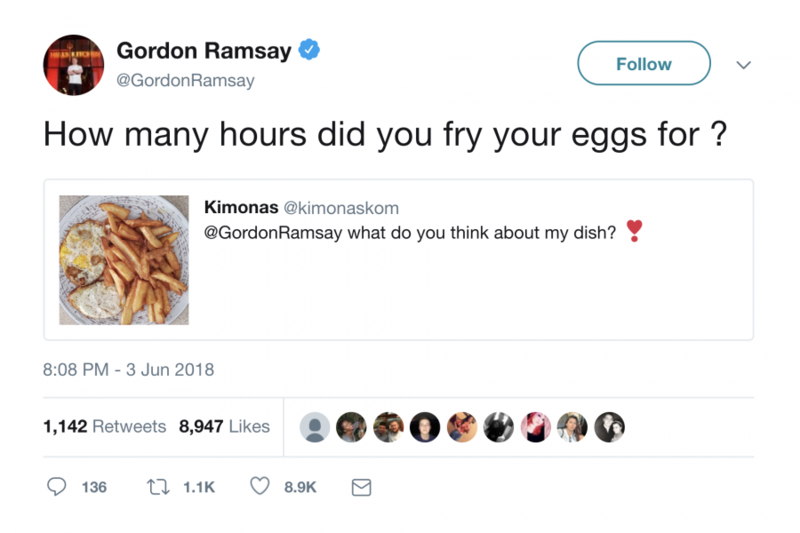 Gordon Ramsay insults can sometimes be vague, like he is asking an honest question, but the intent is clear. These lentils do not look the least bit appetizing to him. And really, why should they? Judging by this picture, no effort was put into making them presentable whatsoever. They may taste great, but that’s certainly not the impression you would get from this image. When all you have is a picture to show your dish to a chef, you better make sure it looks great. This doesn’t even have any sort of garnish to give it a little bit of colour. Even the guy who made that terrible looking fake poutine had the sense to toss some green onions on top to make it look slightly more appetizing. These lentils are just an unmitigated disaster of cooking. If this ended up on a plate in front of you, you might start to think about what they would look like if they were vomited back up. That’s not exactly a pleasant thought. Maybe Gordon was right to pass on these. Imagine this scenario: you have put hours, no, days into making the perfect soup. You’ve simmered your stock for so long that it becomes imbued with rich flavours and colour the likes of which most people never get to see in their own kitchen. 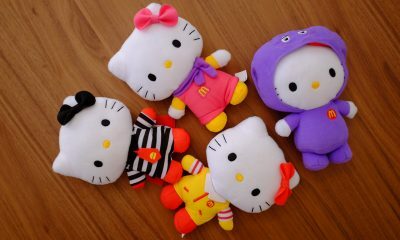 You pour your heart and soul into what you do, and you come out with a product that you are truly proud of. You think to yourself, “This is fabulous. This is possibly the greatest thing I have ever cooked in my kitchen. I need to share this with someone, but not just anyone. I need to show this to Gordon Ramsay!” You load up Twitter and you throw your picture up on it, and you send it over to chef Ramsay. As you await the inevitable praise he is going to send your way, you start to consider a career in the culinary arts. Why not? You are a master of broth, after all. How much harder could everything else be? As you are daydreaming about spending hours in a beautiful, stainless steel adorned professional kitchen, you get the notification that Gordon Ramsay has responded to your tweet. 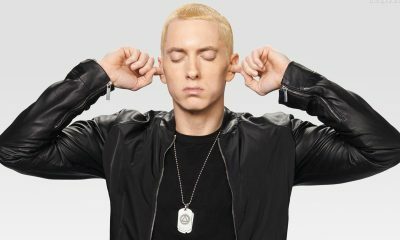 You open up his reply, and you see that he has completely insulted your broth. You give up on cooking, you pour your broth down the drain, and you microwave a hot pocket. Little known fact: chicken parm is what heaven tastes like. You can fact check us on that. Chicken parm is one of the greatest things that anyone can produce in their kitchen. However, when it is not done right, it is not just an unfortunate culinary incident, it is practically an affront to the kitchen gods. 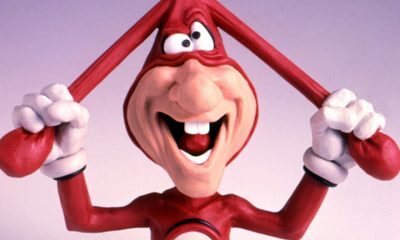 In this instance, the chicken parm that was made by this person is the latter. Chicken parm should look like a renaissance painting. The colours, textures, and flavours should all compliment each other, combining playfully on the plate. However, this person’s pitiful attempt at chicken parm is just the opposite. It looks like a child’s drawing, and not even one that makes it on to the fridge. Perhaps Gordon Ramsay’s criticism of this plate of food will help this person realize that chicken parm is not to be taken lightly. It is not something to be trifled with. If you’re going to do it, then do it right. Hopefully if people learn anything from these Gordon Ramsay insults, it’s that cooking doesn’t have to be hard, but it does require some effort to make your food good. So don’t neglect your food. Follow all of the steps of a recipe, and make sure that you are putting the time, effort, and care into your cooking that it deserves. Otherwise, Gordon Ramsay may be insulting you next.